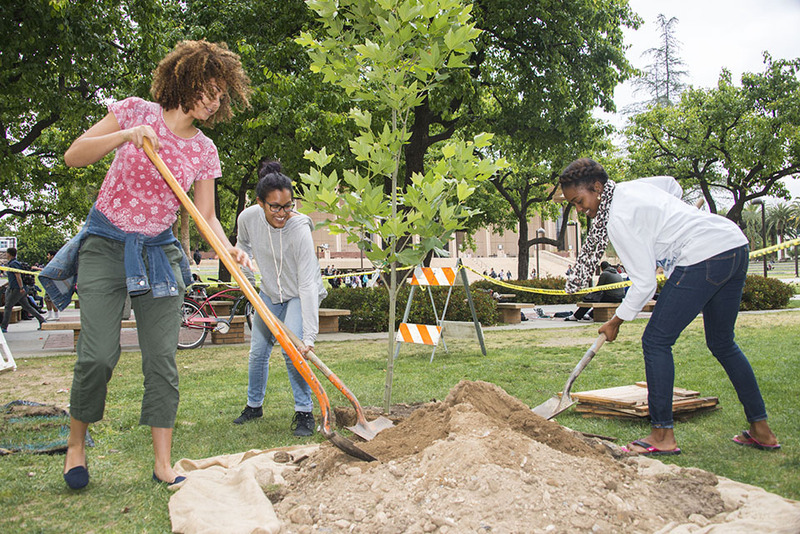 CSUN students planting a tree around the Sierra Quad during Earth Day in 2015. Photo by Lee Choo. The Arbor Day Foundation honored California State University, Northridge this spring as an official Tree Campus USA, recognizing the university’s commitment to effective urban forest management. This was the third consecutive year the foundation has named CSUN a Tree Campus, one of 296 in the nation. “Receiving recognition as a Tree Campus USA for the third straight year really speaks volumes to the efforts we have put into the proper management of our Urban Forest,” said Austin Eriksson, director of energy and sustainability of Facilities Planning, Design and Construction. “The efforts by the Physical Plant Management Grounds Department can be seen all over campus from the hundreds of new trees that have been planted this year, including the major renovation of the orange grove, to the ongoing tree pruning. “All our efforts in managing our Urban Forest not only benefit the campus, but also our community. We constantly see students, staff, faculty and our local community members enjoying our campus landscape whether it be studying, talking with colleagues or walking their dogs,” he continued. CSUN achieved and has maintained this title by meeting Tree Campus USA’s five standards, which include hosting a tree advisory committee, having a campus tree-care plan, dedicating annual expenditures for its campus tree program, having an Arbor Day observance and engaging students in a service-learning project. Tree Campus USA is a national program created in 2008 by the Arbor Day Foundation to honor colleges and universities for effective campus forest management, and for engaging staff and students in conservation goals. The Arbor Day Foundation has helped campuses throughout the country plant thousands of trees. In 2016, Tree Campus USA colleges and universities invested more than $46.7 million in campus forest management. More information about the program is available at arborday.org/TreeCampusUSA.